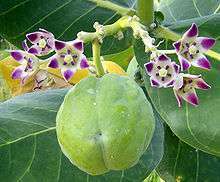 Calotropis is a genus of flowering plants in the dogbane family, Apocynaceae, first described as a genus in 1810. It is native to southern Asia and North Africa. They are commonly known as milkweeds because of the latex they produce. Calotropis species are considered common weeds in some parts of the world. The flowers are fragrant and are often used in making floral tassels in some mainland Southeast Asian cultures. Fibers of these plants are called madar or mader. Calotropis species are usually found in abandoned farmland. Calotropis gigantea and C. procera are the two most common species in the genus. Calotropis gigantea grows to a height of 8 to 10 ft (2.4 to 3.0 m) while C. procera grows to about 3 to 6 ft (0.91 to 1.83 m). The leaves are sessile and sub-sessile, opposite, ovate, cordate at the base. The flowers are about 1.5 to 2 in (3.8 to 5.1 cm) in size, with umbellate lateral cymes and are colored white to pink and are fragrant in case of C. procera while the flowers of C. gigantea are without any fragrance and are white to purple colored, but in rarer cases are also light green-yellow or white. The seeds are compressed, broadly ovoid, with a tufted micropylar coma of long silky hair. The stigmas and androeciums are fused to form a gynostegium. The pollen are enclosed in pollinia (a coherent mass of pollen grains). The pollinia are attached to an adhesive glandular disc at the stigmatic angle. When a bee lands on one of these, the disc adheres to its legs, and the pollinium is detached from the flower when the bee flies away. When the bee visits another flower, the flower is pollinated by the adhering pollinium on the bee. The milky exudation from the plant is a corrosive poison. Calotropis species are poisonous plants; calotropin, a compound in the latex, is more toxic than strychnine. Calotropin is similar in structure to two cardiac glycosides which are responsible for the cytotoxicity of Apocynum cannabinum. Extracts from the flowers of Calotropis procera have shown strong cytotoxic activity. The extracts are also harmful to the eyes. Cattle often stay away from the plants because of their unpleasant taste and their content of cardiac glycosides. The plant is known as arka (Sanskrit) in Sindhi اڪُ Ayurveda, Aak in Hindi and Urdu. The latex is said to have mercury-like effects on the human body, and is some times referred to as vegetable mercury. Sometimes leaves are fried in oil for medicinal purposes. The root bark has a digitalis-like effect on the heart, but was earlier used as a substitute of ipecacuanha. The flowers of the plant are offered to the Hindu deity Shiva and Hanuman. Floral tassels made from Calotropis flowers. Wikimedia Commons has media related to Calotropis. ↑ "Calotropis R. Br.". Germplasm Resources Information Network. United States Department of Agriculture. 2003-03-13. Retrieved 2010-06-26. ↑ S. Morris Kupchan; John R. Knox; John E. Kelsey; J. A. Saenz Renauld (25 December 1964). "Calotropin, a Cytotoxic Principle Isolated from Asclepias curassavica L.". Science. 146 (3652): 1685–6. doi:10.1126/science.146.3652.1685. PMID 14224519.